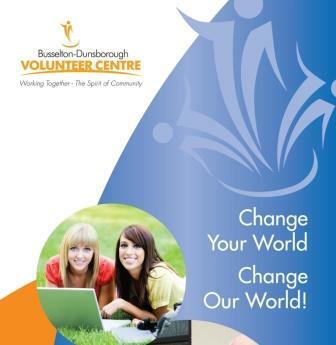 The Busselton - Dunsborough Volunteer Centre is an initiative by local people for local people. We are situated in the heart of Busselton in the new Community Resource Centre behind the Busselton Library, a short walk from the famous Busselton Jetty. The centre is staffed on Mondays & Tuesday 9am to 4pm, Wednesdays from 10am to 3pm. A touch screen is available to browse our on-line volunteer listings. The Busselton Dunsborough Volunteer Centre is provided by the Busselton Dunsborough Environment Centre (BDEC) and funded by the State Government through the Department of Local Government and Communities’.